If it’s stability in the white zone, hull speed when you need it most, or linking cartwheels in your favorite play-spot the FLY is the most versatile boat that can do it all. Comes equipped with tracking keels to stay on-line, incredibly forgiving chines and a super fast displacement style hull. the combination of low volume of 205 liter and the amaizing low weight of 15 kilograms make smaller famed paddlers awfully happy. Paddlers hip to end swapping find the low volume ends nice and slicy while play boaters are psyched with how easy t surf and great-to-squirt the FLY is. It will make you look good! Those who were unable to stay on a wave before will now be able to pull off multiple blunts within minutes. Moderate width with a very flat mid-section give the MACHINE the speed and looseness it needs to go off big. Off-the-lip maneuvers, blunts, and spins till you get dizzy are all within any playboater’s grasp. It’s a flatwater end-swapping MACHINE, even for lightweights, as the volume is minimized in the bow and stern. The pronounced concave chine is carried over from the LUV. Awesome edge grip for carving or the slippery ride you’ve been after. For you to decide, it’s all a matter of tilt. While a notch narrower than the LUV, the MACHINE’s cockpit is roomy and foot room is much larger than other boats of similar. The new fully adjustable seat, thigh brace and outfitting system will allow a snug fit, no matter what your dimensions. The MACHINE surprises you with it’s looseness, speed, and forgiving, easy-initiating manners. It blurs the line between rodeo star and weekend warrior… perhaps it makes looking good too easy? Named after one of the most beautiful, whitewater river in New Zealand, realizes a completely new boat concept. A short boat with flat hull and slight chine: the distinct markings of a play boat. The larger volume with a distinct rocker is ideal for application in big water river running. 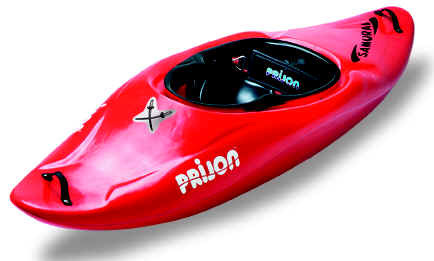 Any paddler can exhaust the multitude of possibilities this boat has to offer in any river conditions. 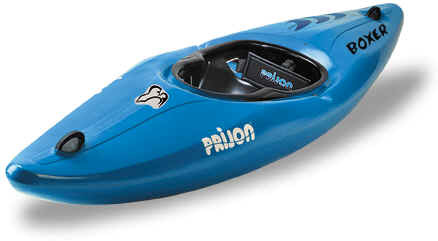 A boat with the perfect combination of speed and maneuverability that will allow the kayaker to paddle a wild river or play hard in the most demanding play spot. This boat has adequate leg room and a large cockpit enabling a comfortable seat position and high safety standard for the paddler. An extremely radical Rodeo boat that was previously only a dream for Rodeo paddlers. This boat will take you to a new dimension in Rodeo paddling, performing the latest maneuvers and creating even more radical moves, shaping the future of Rodeo. But beware, this boat isn’t easy to paddle! You need time to get used to the Alien and you should not dismiss it after only one trial run. As with most specialist sports equipment, you have to learn how to get the best performance from the equipment. The Alien is a specialist boat and the move you make are limited only by your own paddling skills, not the limitations of the boat. At 295cm the Boxer is the fastest, most stable craft able to hold a lot of gear for multi-day and day use. Loaded down or not, the Boxer is incredibly nimble allowing superior speed. This boat features forgiving chines for maximum stability, keels for unmatched tracking, a long waterline for amazing acceleration and even rocker for surf and play. Perfect for extreme whitewater creeking. With a high volume, round hull and distinct rocker, it is extremely agile. The boofing and resurfacing characteristics are outstanding. Nimble and stable, as will as delivering a predictable response in a forgiving design. Classically suited for paddlers who demand accelerated eddie turns, simple rolling and easy paddling characteristics. Small to mid-sized paddlers fit properly into the cockpit and find the Cyclone’s even volume distribution comforting to move around on the water. Fast and easy cruising, this boat is a river runner’s dream.